Do you know what kind of flower this is? Let us know in the comments! We have a lot of flowers on the grounds, and this had me wondering what kinds of flowers were in Norma’s own backyard! Here are three I have been able to identify so far. These flowers are purple when they bloom and turn white over time. 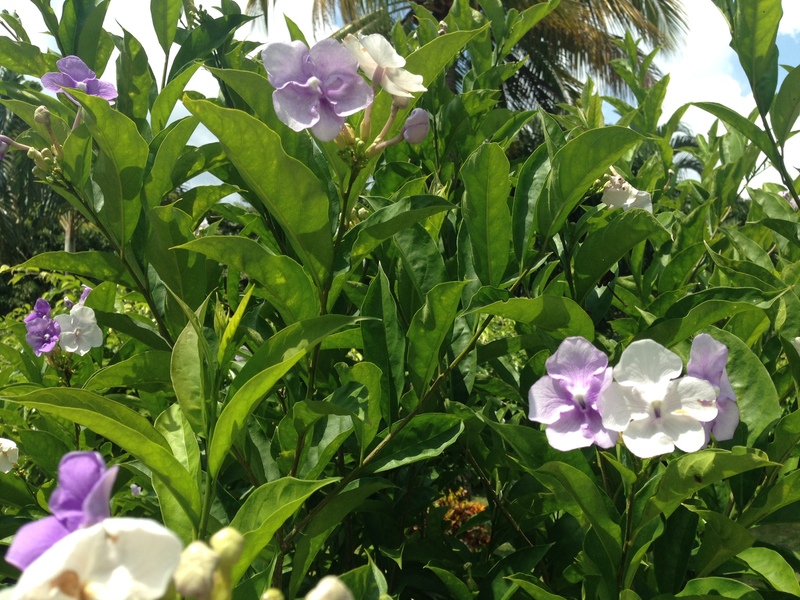 Few other plants will make you so aware of its own mortality—Also known as the “Yesterday-Today-Tomorrow” or the “Kiss Me Quick,” the Brunfelsia is a lavender color when it blooms, and the color fades to white after only a day, two at the most! This flower grows in the shade or in partial sunlight, and blooms year-round. More than just a pretty face: This flower has been used to cure fevers and arthritis, and has been helpful in curing a parasitic disease spread by sandflies. What looks like a flower is really a colorful leaf! Think of it as a drinking fountain for hummingbirds! Water collects in the stems of the heleconia for hummingbirds and other living creatures to eat. And we certainly have hummingbirds here at Norma’s. There are over 40 types of this plant—some have upright flowers, like this one here, and some heliconia have dangling flowers. The dangling ones look a bit like crab claws hanging from trees! You might be thinking—They sort of look like bananas! 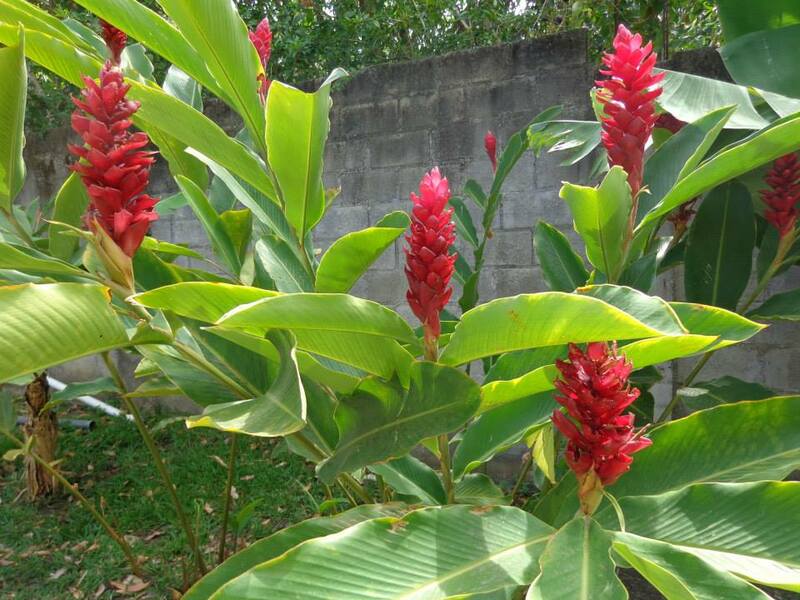 Heliconia flowers are actually related to bananas, which we also have at Norma’s! We also have yellow orchids! 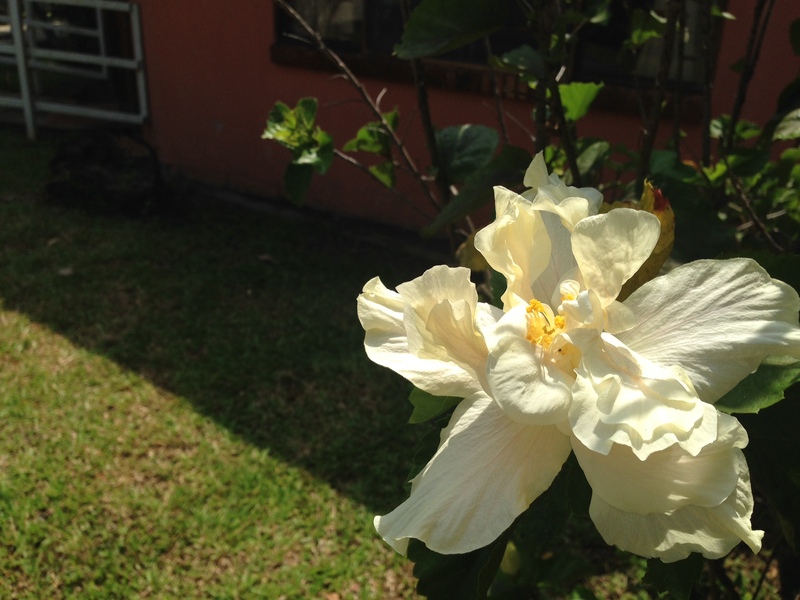 Costa Rica is home to over 1300 types of orchids, so I knew I’d find one on our grounds! Costa Rica’s national flower is the guaria morada, a beautiful pinkish purple orchid. 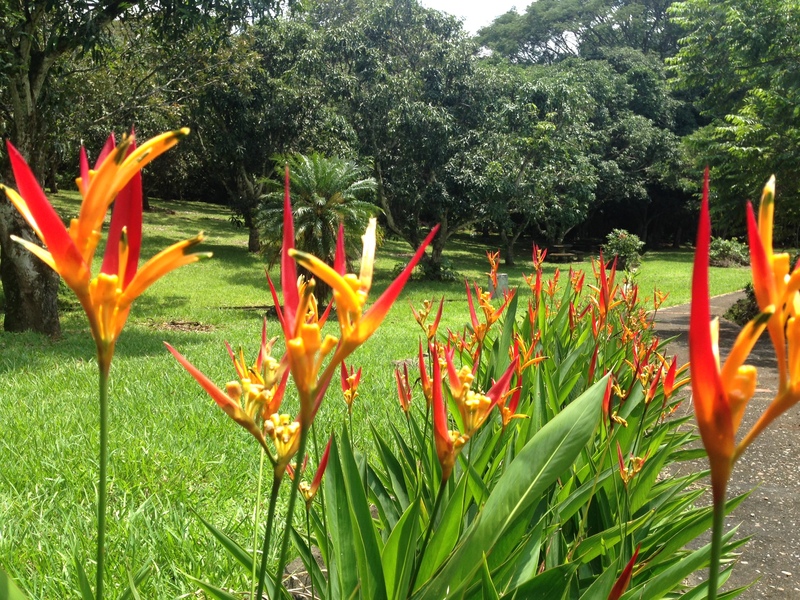 Orchids love to grow in Costa Rica, and even the Botanical Orchid Garden of Costa Rica is in our town of La Garita because of its amazing climate! Costa Rica also hosts many orchid festivals. We have many, many more, so I may make more posts featuring more life around Norma’s! Norma always says that people are like plants—We all need sunshine and water. If you can recognize the first photo, please let me know what kind of flower it is!